"I just bought the plans for the M2. 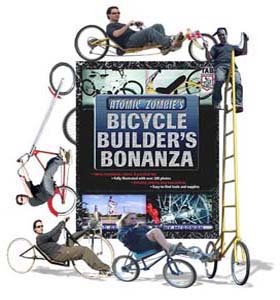 Also, I have ordered the Bicycle Builders Book. I've been reading the threads in the forum and have some questions." "I'm looking to get a cheap stick welder so I can make this new hobby of mine. I know a couple of retired boilermakers and wanted their advice on brands etc but we didn't get that far because they were adamant that it would be virtually impossible to weld bicycle frames with such a welder without blowing holes. Now everyone on this forum is quite adamant that these welders would be fine, and I believe them, because they have the anecdotal evidence." "The Citizen editorial noted a necessary balance between the views of both business owners and cyclists when considering a pilot project for a cross-downtown cycling corridor." "Hi Kat. Attached is a photo of my warrior for the gallery. Regards, Michael (Mick) Bauer from Germany." Well done, Mick! 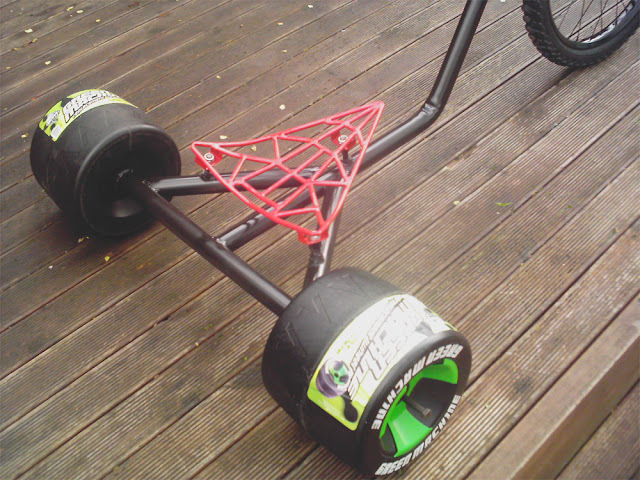 Thanks for sending us a picture of your awesome tadpole trike. If you have been eying up those expensive imported recumbent trikes, but think $4,500 is a bit too steep of a price tag, then get out your tools and build it yourself! 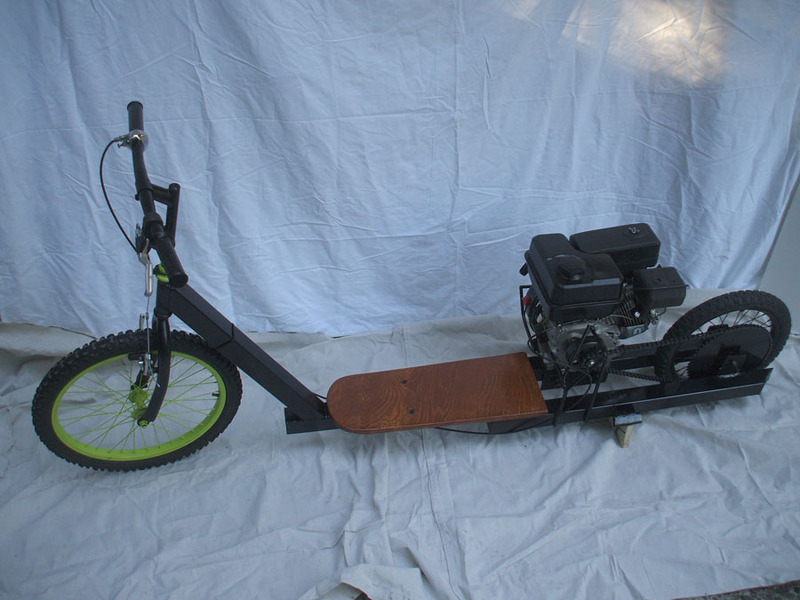 For thousands of dollars less than the price of a basic tadpole trike, you can create your very own racing trike that will rival many of the factory built machines available. "Hi. Thought I would send you a better picture of me and my son on the tandem bike we made using your great book. We are going to make recumbent bike next. Hope you put it on your website. Thanks, Perry." Those smiles say it all. Well done! Happy riding. "Hi KoolKat. 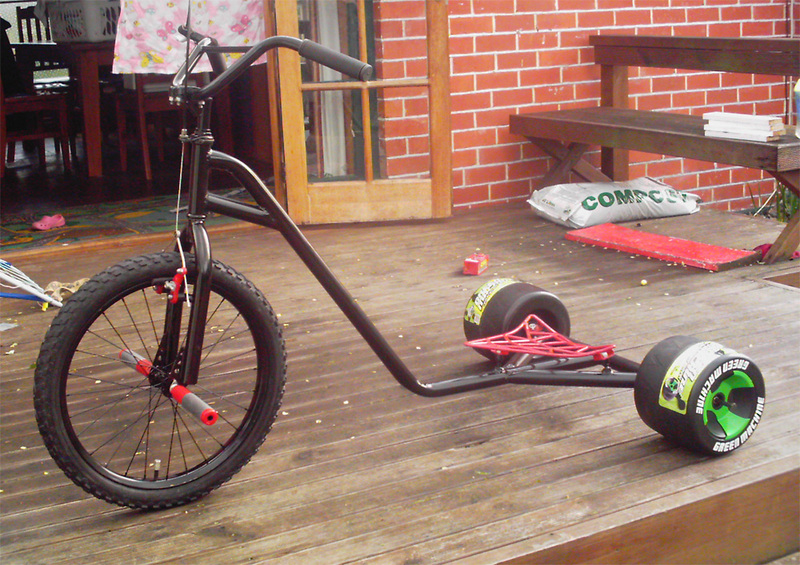 Here is my latest creation the Viking Tandem it performs real well and my wife Helen and I are very happy with it. Best Regards from Down Under, Kurt Gahler"
Thanks Kurt and Helen for sending us this picture. Looks like you two are enjoying your new home built tandem. Nice job! "Successful first work commute with the Street Fox velomobile! The trike zipped right along, kept me dry (it was raining lightly) and covered the 21 miles in one hour flat. This time successfully meets my original goal. Electrical output was pretty consistent over the entire trip. Power consumption was 12 amp hours from the 16 AH total capacity twin battery pack." 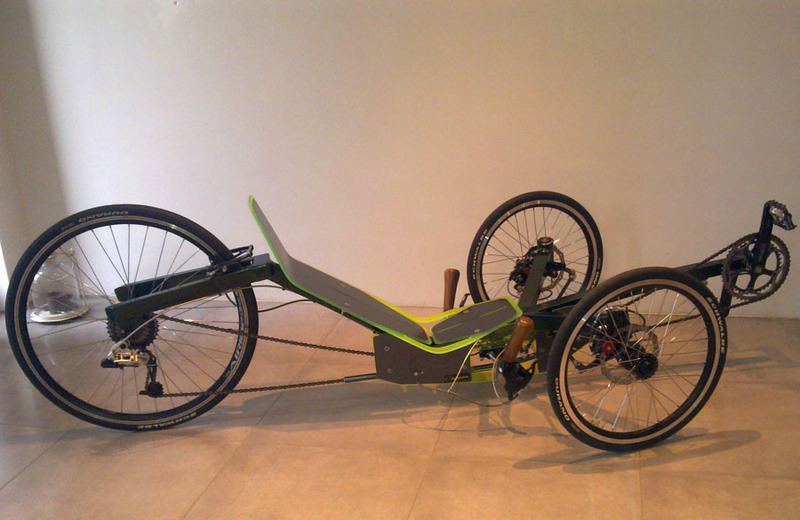 "Nearly finished with the Kyoto recumbent cruiser trike I started this summer. Started and stopped several times throughout for various reasons (parts, frustration, heat, etc. ).This was a little tougher than the other 2 trikes I have built because of the double stuff I guess. Had every intention of taking lots of pictures but got caught up in work and the building and just plain forgot. I did start out taking a few pictures though so I will post them and hopefully wrap up the build and post the finished trike pictures in a day or two. Thanks to everyone here for the info and ideas." "I thought I would send you an update on my Streetfox. I sewed up a new seat cover and electrified it. I have around 90 miles on it now and I'm building another one for my wife. Thanks again for the plans. It sure is a lot of fun to recycle old bikes and put them back to work. ~ Richard"
"Hi. Here is the tandem my son and I made using your most excellent book. We love riding it." "What would you do if you found a bike on the side of the road that had obviously had a sudden and catastrophic failure? Example: Today I found a department store Schwinn mountain bike that had been 'overshifted' - chain came off the low gear in the back, bound between the spokes and the freewheel, and twisted the derailleur all to hell. Besides being unrideable, it's in great shape." "Hi. Attached is a picture of the "truck" I created for my shop. Love the creativity of the bikes on your site. Look forward to more. Thanks, David Roberts"
"Hi Krew. This is what I have been up to this weekend. After a much needed clearing of the bench I have started on the FunkE chop for my wife. I started yesterday and this is how it is so far. I am pleased with the way it is going. I did have a plan but I should have learned by now that once I get building my imagination takes over and it just happens. I like it that way. Hope you like it to. It will have a 250W motor with 36V electrics enclosed in the "Tank" in the head tubes with a storage area for waterproofs and a flask of tea along with all the other stuff women seem to want to cart around with them. All the best. Tim"
"Hi all. I know it's early to think about Christmas, but what the hey. I am building a new sleigh for my Christmas display, but this year is going to be my last (as I am leaving town and states), so I thought it might be great to build a trailer to tow the sleigh behind my electric trike. The trailer will be 1000mm long and 800m." Greetings. My wife said I should get around to submitting my 12' long chopper, 60 degrees of rake, 4 3/4" trail. I sacrificed a 26" mountain bike for that "science project" just to see if a bike 144" long (from tip of wheel to tip of wheel) would be ride able. It is not practical, but fun and controllable! CNC machined triple clamps and drop-outs, the rest is 1" tubing bent on my hydraulic tubing bender and TIG welded together. Did the majority of the construction on my lunch breaks! Fun project! "My completed Highroller for the gallery. Brad and Kat - You guys ROCK. Thanks for all that you do and these plans and this site. ~ BradinSTL"
Thanks, Brad. Another great looking bike! Nice job. also making one for me will put up pics soon." Join the discussion: Show us your workshop! "Hi AZ krew. I hope you are all well and busy. I am looking for one or two banana seats for a project of mine, and above all for a good friend." "Hi Brad. Here's a pic of my Warrior for the gallery. Thank you for the great design. Tim"
Nice job, Tim. Thanks for sharing with the bike building community! 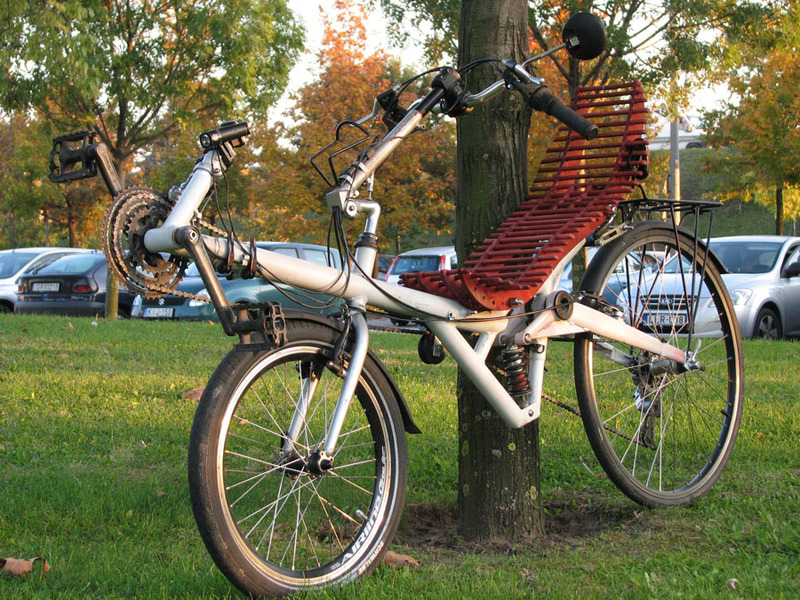 "At first glance, a proposal to replace a bicycle's familiar chain and cog drive with one that uses string may sound like lunacy, but that's exactly what's been done to produce the Stringbike. 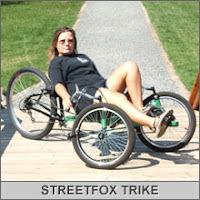 The system features freewheel mechanisms on either side of the rear wheel connected by polyethylene rope to a precisely positioned, symmetrical swinging arm that drives the bicycle forward. When the unit on the right is driving the bike forward, the other is being returned to its starting position and vice-versa which is said to result in greater efficiency and makes for a more comfortable, easier ride." some loose ends and then road testing." See Warrior trike photos from France . "The biggest beef that drivers have with cyclists seems to be that too many are scofflaws who are hardly ever held accountable for what they do or don't do on the road. 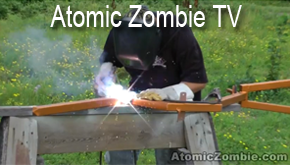 "Dear Atomic Zombie, I'm sending you info about my latest finished recumbent project. I also have a blog about my home made recumbents here http://rekumbens.blog.hu ." "Hi Folks. I've recently put together a HighRoller, thanks Brad for the plans & thanks to the community out there. I've not ridden recumbent before so I'm currently somewhere on that learning curve." Read more and join the discussion: Deep South 'Roller, Ride Reviews? "Hi. Here are pics of my first homemade bikes, am working on two trikes at the moment (one for my 5 year son and one for me) will send pics when done. These two bikes were quick builds. 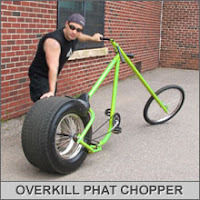 The first one chopper style on a 12inch wheel size. My 3-year-old loves this. The next a drift trike I made for my 16-year-old nephew. 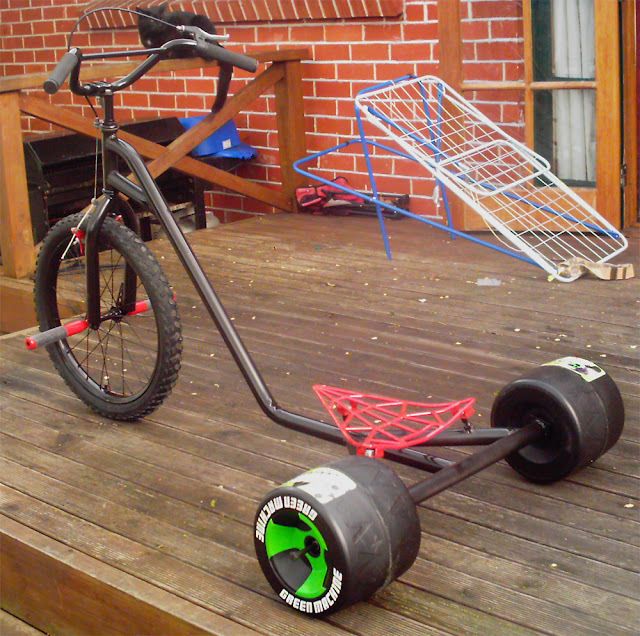 It has 20 inch front wheel and slides real nice. By the way, I am in New Zealand. I will send more pics as I build more. Cheers, Paul Mimmack"
"Hi krew. My wife has fallen in love with stretch beach cruisers. Can anyone point me in the direction of, or tell me how is the best way to make those nice clean sweeping curves in the frame please. I have a conduit bender with 20mm and 1" forms and have experimented on some scrap, but can not make anything smooth and nice looking. "What I have done so far looks mechanical. I am after that sweeping organic kind of curve if you know what I mean. My god I'm starting to sound like a hippie already. Next I'll be building bikes with rose tinted glasses instead of a welding mask, whilst listening to the Beach Boys! Many thanks for any help you can offer. All the very best. 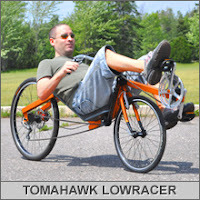 Tim "
John Austin shows off his newly completed homebuilt TourMaster long wheel base recumbent bike. Nice job, John! 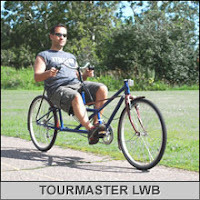 The TourMaster is an extremely comfortable long wheelbase recumbent cycle made for commuting, long tours, or just getting out enjoying nature. Because the rider sits in a reclined adjustable high back seat, you will enjoy both the ride and the scenery without straining your neck or bottom. The TourMaster is a unique long wheelbase recumbent design, as it includes a linked steering system to place the handlebars in a very relaxed and natural position. The TourMaster is a rock solid performer and offers a super smooth ride due to the dual 26 inch wheels. 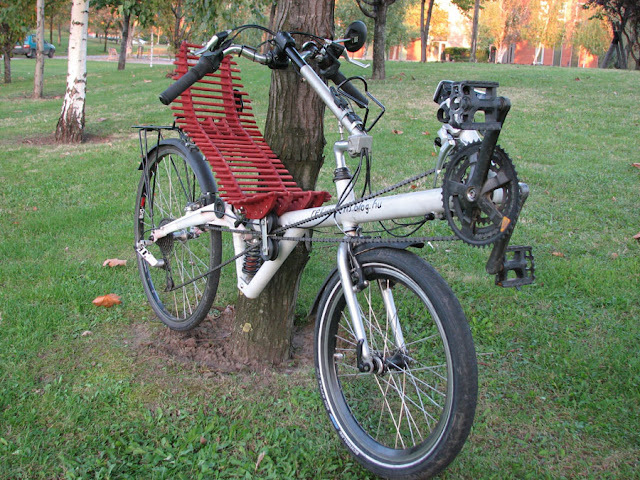 The TourMaster is a very easy bike to build, requiring only two scrap bicycle frames and the usual cycle components, so anyone with a welder, grinder and a bit of patience can build their own high quality recumbent cycle in a few days. There are no machined parts used, no hard-to-find bicycle components. You can use practically any type and style of cycle parts you like. The adjustable seat allows riders of any size to fit the cycle, and you could even make a smaller version for the younger cyclists using kid's bike frames. Cruising along on a laid back and comfortable recumbent cycle feels so good that you will forget that you are getting fit at the same time. Even the unseasoned cyclist will have no problem riding the TourMaster for hours since it was designed around your body, not forcing you into an unnatural riding position. 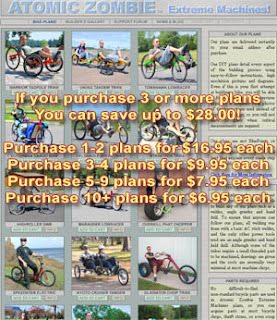 Recumbent cycles are the way to go. Once you feel how comfortable cycling can be, you will be "bent" for life! Take a look at our Builder's Gallery to see other TourMaster examples, including many creative modifications to the plan. Our international builders community ranges from students to retired engineers, but they all have one thing in common - the desire to build their own stuff! "Hi. I had a lot of fun building my Deltawolf. The first time I took it out two people asked where I had bought it which made me feel really good. 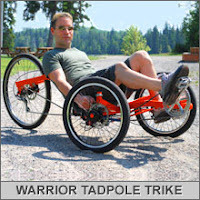 I am going to start soon to build a Warrior tadpole for my wife. ~ Bob "
Human powered trikes come in two varieties - two wheels at the back (delta), and two wheels up front (tadpole). The general opinion is that tadpole trikes are made for speed and comfort while delta trikes are great for load carrying, pulling trailers, and sending granny off to the shopping mall. But, not anymore! 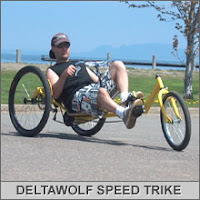 The radical DeltaWolf breaks all the rules that have held delta trikes back for so many years. This trike is ultra low, very laid back, designed for comfort and speed, and has full-sized 26 inch rear wheels thanks to unique, yet easy-to-make rear hub axles. The DeltaWolf is also designed to be easy to build using only a welder and an angle grinder, and requiring only a single part to be machined (plans also show alternative to this machined part). 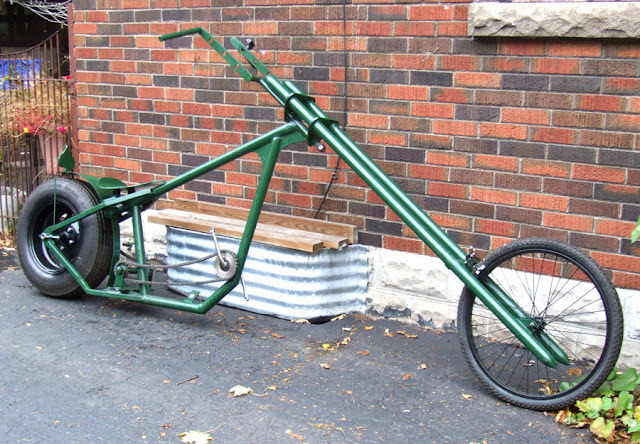 The rest of the trike is made using a few feet of square tubing and standard bicycle parts that can be purchased new or salvaged from scrap bicycles. Even the unique rear wheel hubs are made using nothing more than a hand drill, and a few washer shaped steel discs. There are no hard-to-find parts used in this project, and the only part that needs to be machined is a small threaded part that will allow a standard freehub to connect to one of the rear axles. The total cost of building the DeltaWolf including the machined part is about $200, and could actually be much less depending on the size of your junk pile. 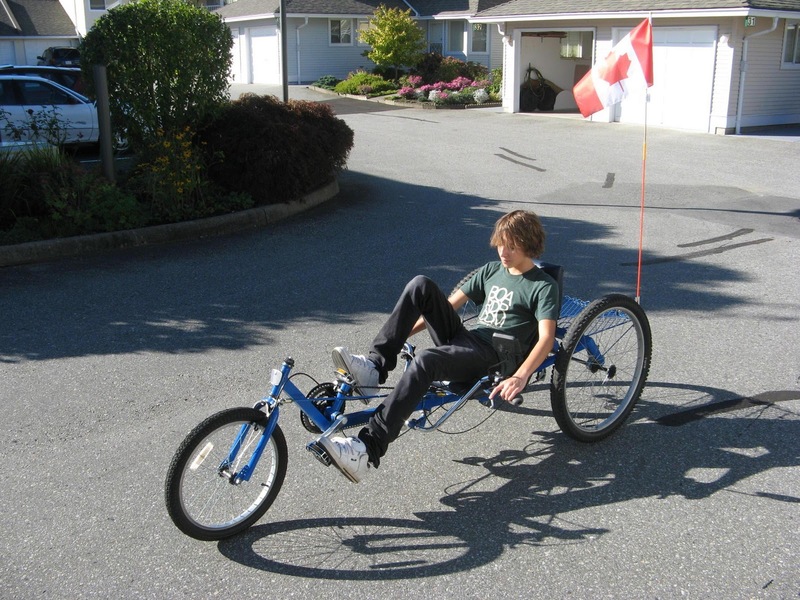 The frame is made from mild steel square tubing, and can be put together in a few evenings, not bad for a trike that looks as good as it rides. Check out the video to see how well the DeltaWolf behaves as it handles tight corners and straight-aways. Sucess with brake drum forge ! !